Interactive presentations are superior to the static ones. That’s why I am always on the lookout for good interactive presentation games to incorporate into my talks. I learn these games and interactivity devices, I try them, and then I share the results with you, and hopefully, you try them as well. The interactivity in your presentation depends on all the interactive games and devices you string throughout the talk. The more tools you know and implement, the more interactive your presentation will be. You can’t just rely on one device; you have to keep adding more to your toolbox. 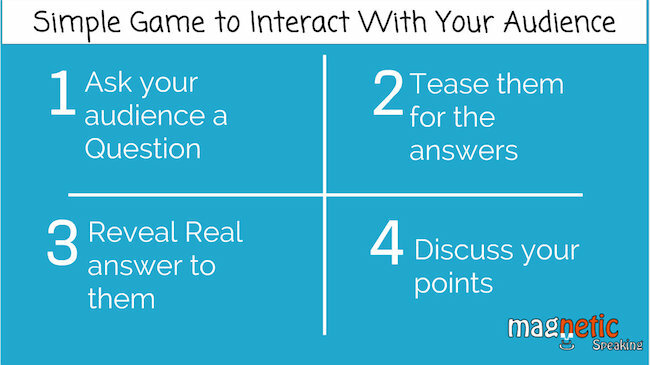 In this blog article, you will learn a simple interactive game you can use in your next presentation. Before you reveal a statistic or a fact to your audience, ask them to see if they know it and have them guess the correct answer. Don’t accept the first answer they give you even if it’s the correct one. Tease them for more responses and comment on the answers they give you. The commenting can be as simple as saying “that’s close,” or you can also use funny remarks to keep your audience engaged in a lighthearted and fun atmosphere. I experimented with the optimal number for teasing, and I found (from my experience) that three times is best. I noticed that the first 3 teases raise the energy of the room and after that, it starts to drop. I would suggest you do your test and see how that works for you. You can point to people and put them on the spot and ask them what they think or to make a guess. Once you have some answers, you can reveal the real answer. Finally, after you hear from a few of them, you can go ahead and tell the answer. Note that this could be a response that they shouted out already. That’s fine, just tell those people that they were right or close. Usually, the game is played to get people engaged and enrolled in the conversation. Once you achieve that, then you can go ahead and make your points. Me: Jennifer, what do you think? Me: we are getting close, last one, Mike what do you think? Me: Close, it’s 8 seconds. It’s less than the attention span of a Goldfish! There are two reasons to why I am sharing this piece of information with you about attention spans. The first is that I want you to add more engagement devices to your presentations so that you can keep grabbing the attention of your audience. 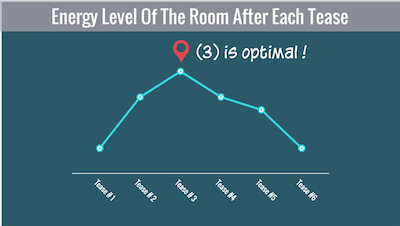 The interactivity in your presentation depends on you applying multiple games and formulas like this one. The more tools you know and implement, the more interactive your presentation will be. I hope this tool will make your list. Let me know what you think in the comments below. If you have one or few interactive games you would like to share, please share it – I would love to hear from you.